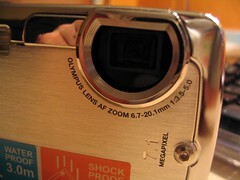 The Olympus 720SW, available in three colours (Dusky Pink, Polar Blue and Steel Silver) is unique in that it can resist the usual amount of abuse that your typical camera would take on the chin. We’re talking shockproof and water proof. These two features alone should make this camera an attractive buy, especially for the upcoming summer holidays. The 7.1 million-pixel resolution CCD ensures that you get impressive results whether it’s a 6×4 shot for the photo album or A3 poster sized prints that go up on the wall. The resolution for the full Super High Quality setting is 3072×2304, which by any standards is huge. With most cameras you’re going to want to be very careful since you might scratch the screen or damage the mechanics of the zoom lens, but with the 720SW you can pretty much subject it to any abuse within the specified limits and it will still carry on working. The tests they have done on this camera are the same standards used in the military. You can expect this camera to survive 1.5m drops on to pretty much any surface wet or dry, and be able to snap pictures up to 3m underwater. This is another reason why this camera is ideal for pretty much any setting or surround you can think of. Perfect for this summers skiing in the Alps or underwater fun at sea world! I have tested the claims and it does what it says on the tin. I dropped it on to various surfaces starting with carpet and then moving on to the hard kitchen floor as well as laminate floor. Not one scratch, dent or mark appeared on the camera. I was expecting at least some marks to appear on the 2.5-inch LCD display. I was surprised to find no marks, or indications of any damage whatsoever to the camera. This was a shocking discovery! Now in terms of picture quality you’ll find this to be an overall good camera. The 7 mega pixel resolution produces ultra-sharp quality thanks to the image stabilizer and the ability to select from up to 24 different shooting modes. You even get a few underwater shots which will increase the clarity of the LCD screen so that you can see what you’re shooting underwater. Olympus calls this BrightCapture technology and all this does is feeds all of the information from the CCD chip and displays it on the gorgeous screen with full quality so no information is lost and what you see on the screen is what you’re actually shooting. Often cameras don’t do this and most of the time you don’t notice but in a premium camera like this you’ll want to make sure your shots are as good as they can be. 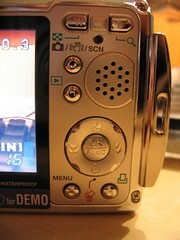 A more interesting implementation of scene modes on the 720SW is the Guide mode. When you select this from the mode dial you are presented with an option menu that has textual descriptions of the scenery that you’re trying to capture. This in general works really well, providing you are in that particular scenery. If not then it can become useless as shots that don’t fit these descriptions closely will come out with varying results. 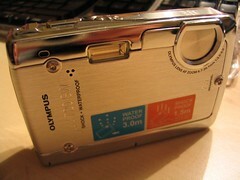 The usual features that can be found on most compact digital cameras these days are found in the 720SW. With a 3x optical zoom and PictBridge support, alongside movie mode which allows you to record up to the capacity of the memory card at 640×480 (15fps) resolution. The 720SW is an all round camera with a simple frame and shoot system. This means that the camera does fail in certain areas. Macro mode is at 7cm and whilst most casual users who are using this as a holiday snapper wont worry about this. Those who want to do close up snaps of items they want to post on eBay or product photography or those who like photographing plants and flowers up close will struggle with focusing. I also found problems when shooting in low light conditions. 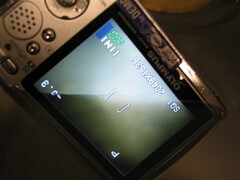 The 720SW struggled to set the correct white balance even when using the indoor mode. Pictures looked dark despite being in a well lit room. Noise was also an issue in this scenario as the camera tries to compensate for low light entering the lens by increasing the ISO setting. The general rule of thumb with ISO settings is the higher the number the more noise you introduce in to the picture. The 720SW has settings from as low as 64 right up to 1600! Whenever I was taking a picture which had a large portion of the capture being one colour, this was where the noise occurred. Shooting landscape and portrait shots from distance and in well lit conditions, as you would with most of your holiday snaps, is going to be perfectly fine for this camera. You can expect to capture clean and sharp pictures with the right level of contrast and colour tones. The anti-shake function uses the digital image stabiliser to maintain blur-free photos and in general worked really well. Just make sure to select this before you get on the rollercoaster. The integrated lens is a design feature by default since the whole camera is designed to be water proof. This is protected by a metal lens cover that automatically slides down when you power up the camera. With it you get this nice clear cut metal dicing sound. On the note of start up times, you can expect to be up and running very quick wit this camera. We’re talking 1.5 seconds from pressing the power button for the camera to be ready and focused to take a shot. Since Olympus cameras use XD cards you can also expect fast write speeds in preparation for the next shot. This means that the burst mode shooting works more effectively than cameras with slower write speeds. What I find disappointing with all camera manufacturers however is the lack in capacity of the memory cards that are supplied with cameras. 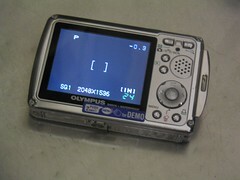 For a high resolution camera such as the 720SW you would expect to get more than 19MB of internal memory. In terms of battery life, the 720SW comes with an external charger and a Lithium Ion battery. In our tests we fully charged the battery before using it and throughout the two weeks that we had it, not once did we have to recharge or were warned the battery was low. During those two weeks we photographed in the region of 150+ photographs and various video clips as well as messing with menu settings and data transfer to the computer. This is impressive but expected from any compact camera that encompasses a rechargeable battery. It is not unheard of for cameras to be able to take hundreds of photographs on one charge. Casio are well known for this feature but Olympus has done a very good job on power saving features as well as using a high capacity Lithium Ion battery. All in all this camera is definitely feature packed and as sleek as they get. If you’re looking for water proof and durable camera then there is only one choice. The Olympus 720SW as far as I’ve seen and best to my knowledge is the only compact consumer camera that is able to withstand the claims of 1.5m drops and 3m underwater usage (without using any extra add on or waterproof case). If you buy the optional case for it you can extend underwater depths as far as 40m which would make it the perfect diving camera. Photographs are very sharp in well lit conditions but fails on the low light shots with picture noise. The design of this camera gives the holder a definite build quality that screams design and elegance with its one-piece all aluminium scratch-free body. The 2.5-inch LCD display is bright and beautiful showing an accurate reproduction of what the CCD is seeing from the lens. Fast shooting times and excellent usability make this the perfect camera for this summer season. You can have plenty of fun in the sea and sand with the 720SW without having to worry about it breaking.